Does the Village have the legal authority to block the Cell Facility? No. Cell facilities are regulated by federal law, and the Village has virtually no authority in this matter. Can the Village regulate the level of Radio Frequency (“RF”) emissions from the Cell Facility? No. RF emissions are set by federal law, and the Village has no authority to challenge a facility that otherwise complies with federal law. Can the Village require Extenet to demonstrate its RF emissions fall within federal safety standards? Yes. The Village has already required Extenet to certify that the Cell Facility’s RF emissions fall within federally mandated safety limits. Has Extenet certified that the Cell Facility’s RF emissions fall within federal safety limits? Yes. Extenet has certified that the Cell Facility’s RF emissions shall be less than one per cent of the federally allowed limit. Will the RF emissions from the Cell Facility be at ground level? No. Extenet has certified that all RF emissions will be at least thirty six (36) feet above the height of a six (6) foot tall person standing under the Cell Facility. Why will the Cell Facility be in the shape of a flagpole with a pedestal? Your Board negotiated with Extenet to have the Cell Facility comprised within a flagpole and a ground pedestal as the most aesthetically pleasing alternative, in keeping with the Village’s colonial architecture, and thus avoiding an unsightly and obtrusive cell tower or utility pole. Has Extenet demonstrated a need for this Cell Facility within our Village? Yes. Extenent has provided evidence, as required by federal law, to demonstrate its need for the Cell Facility within our Village, and that Extenet has no viable alternative to the proposed location. Has Extenet certified that it has explored alternatives to placing this Cell Facility at this location, and within our Village? Yes. Extenet has provided evidence, again as required by federal law, to demonstrate it has explored alternatives both within and outside our Village, and the proposed site is the only viable location. Has Extenet certified that it will construct and operate the Cell Facility in accordance with applicable federal law? Yes. Extenet has certified that the construction and operation of the Cell Facility will comply with applicable federal law. Why the proposed location on the Village-owned triangle at the intersection of Park Avenue and Manhasset Woods Road? Extenet originally proposed to place the Cell Facility on a utility pole in front of a private home. Your Board negotiated with Extenet to place the Cell Facility on public property and not in front of a residence. Does the present application by Extenet permit it to erect additional cell facilities within the Village? No. The current application is limited to this one site. If Extenet wishes to place additional cell facilities within the Village, Extenet must make a new application, which will be subject to the same laws and review process discussed here. Will the Cell Facility improve cell phone coverage? Yes. Extenet has represented that this Cell Facility will improve coverage for cell phones and similar electronic devices, and will accommodate new advances in wireless technology. Will the Cell Facility affect real estate values? Extenet has provided evidence that the Cell Facility will not negatively affect real estate values, but rather should enhance them, given the improvement in telecommunications. Are neighboring villages dealing with this issue? Yes. Extenet has filed applications for multiple cell facilities with Flower Hill, Plandome, Manor, Plandome Heights, and more. It must be emphasized that local authority in this matter is severely limited by federal law. Nonetheless, as described above, your Board protected the interests of residents by, among other things, negotiating for the cell facility to not be in front of a residence, to assure Extenet certifies compliance with federal safety standards, and so forth. Notably, and as mentioned, other villages are dealing with applications for a dozen or more cell facilities, whereas the Village is dealing with only one at this time. Is the Village permitted to charge Extenet a fee for placing this cell facility within the Village? Yes, but in a very limited amount. Once again, federal law strictly controls, and it sharply limits any fee the Village might charge to a very modest amount. The precise dollar amount is still being discussed, and will be stipulated via contract. To be sure, the paramount concern of your Board has been and will always be the best interests of the residents, and not revenue. When will the construction of the Cell Facility commence, and how long shall it take? The exact start date of any construction is, of course, dependent upon completion of the Village review process. With respect to the duration of any work, we have inquired of Extenet as to a time frame. Please look for further updates from your Board. Will construction of the Cell Facility negatively impact residents? Your Board has emphasized to Extenent that it must take all steps necessary and appropriate to minimize any disruption or inconvenience to residents during construction of the Cell Facility. Will the Board require Extenet to appear at a public hearing, and will the Board hear evidence from Extenet’s representatives at that public hearing? Yes. Your Board is requiring Extenet to appear at a public hearing. At that hearing, Extenet will be required to have its representatives publicly testify with respect to many of the matters set forth above. If and when the Village approves the Extenet application for the cell facility, thereafter Extenet will contact PSE&G and Verizon to “walk the site,” i.e., to coordinate with the other utilities. If the site does not require any preparatory work, then the utilities typically issue their own licenses within 45 days. If preparatory work is required, then that time frame is naturally extended. Once the other utilities give permission, the cell facility is typically installed within seven (7) days. Extenet’s construction for the cell facility should take approximately 4-8 hours. Thereafter, Verizon must place and splice fiber cable to the cell facility. What steps will Extenet take to minimize disruption to traffic and inconvenience to residents? Construction will be undertaken after the morning rush hour, and Extenet expects work to be completed prior to 3 P.M. the same day. Signs, cones, and traffic signals shall be employed in order to assure safety and good order. Prior to commencing construction, Extenet will give notice by distributing written flyers to nearby residents. PSEG Long Island is beginning a scheduled project that will improve electric reliability for you and thousands of other customers in your community. It will replace existing poles and related equipment, strengthening the most vulnerable sections of the energy grid against extreme weather. This work is funded by the Federal Emergency Management Agency (FEMA) Hazard Mitigation Assistance Program. PSEG Long Island crews will generally work Monday – Saturday, 7:30 a.m. – 5:00 p.m., with limited evening and Sunday work. No work will be done on major national holidays. PSEG Long Island licensed and approved contractors. Will the project include tree trimming? Trees growing near power lines significantly increase the chance of power outages and pose safety risks. As we expand and improve our electric circuits, we will trim trees, where necessary, following our utility best practice model (ANSI A300 standards as well as the Best Management Practices Tree Pruning publication): 8 feet to each side; 12 feet above; and 10 feet below the conductor. What size and where will the poles be located? The new poles will be approximately the same height as existing poles, have a stronger base and will be placed about two-to-three feet from the current pole locations. Removing old poles requires action from all utilities that have installed equipment on the pole. To expedite this process, PSEG Long Island will actively coordinate with the cable TV and telephone utilities, as well as local municipalities. Will there be any traffic interruptions? Island licensed and approved contractors will provide cones, flagmen and signage at the work site, as needed, to minimize interruptions. Will there be any power outages? PSEG Long Island anticipates some localized, intentional, short-duration power outages related to this project. All affected customers will be notified in advance of any power outage. This project will start in April 2019 and will take approximately three months to complete. Customers with questions about the project can visit www.PSEGLINY.com/FEMA or cna contact PSEG Long Island Customer Service at 1-800-490-0025. As always, customer and employee safety is our primary concern. Please be cautious when travelling near our construction work zones. The Board of Trustees hopes the New Year is off to a great start for everyone. With a few weeks of winter left, we wanted to update the residents on what has been going on in and around the Village and some of the plans we are looking forward to in 2019. IN REMEMBRANCE: The Board of Trustees, on behalf of the Munsey Park Community would like to take a moment to remember and honor one of our local hero’s, Sgt. James “Jimmy” Regan. Sgt. Regan paid the ultimate sacrifice February 9th, 2007. This year marks the 12th anniversary of his death and we honor his sacrifice to our country. The Regan family began Lead the Way Fund in Jimmy’s honor and if you are interested learning more about the great work they do, information can be found at www.Leadthewayfund.org. BUDGET: We are in the process of preparing the budget for the 2019-2020 fiscal year, which begins on June 1 of this year. We will present the budget at our April meeting. MARIJUANA: As is well known, the State of New York is considering the legalization of recreational use of marijuana throughout the State. The Board of Trustees is of the view that the State errs in consideration such legalization and that a retail marijuana store within the Village will have an adverse effect on the health, security and well-being of Village residents and would negatively impact real estate values and the quality of life within the Village. After due consideration of the foregoing, the Board of Trustees voted to prohibit the “fabricating, manufacturing, growing, cultivating, displaying for retail or wholesale, dispensing, or the selling of marijuana or any products containing cannabis (whether naturally occurring or manufactured) or containing tetrahydrocannabinol or derivatives thereof (whether naturally occurring or manufactured), whether for medicinal use or other usesale”. Similarly, we applaud the Town of North Hempstead’s ban of recreational sale of marijuana and thank all of the residents, both within the Village and within the Town, for making their views on this controversial subject known. EXTENET: Extenet, a telecom construction company, has made formal application for the installation of a “small cell node” at the Village owned triangle at the northwest corner of Park Avenue and Manhasset Woods Road. The facility will not be a tower, but rather a typical flag pole and pedestal, replacing the existing flagpole at the site. The BOT is currently reviewing the application, and public hearings will be noticed and held. While federal law greatly restricts local authority in such matters, you can be assured that your Board has actively protected the interests of the residents. Your Board already persuaded Extenet to forego its original plan to place the facility in front of residences, instead locating it on Village property, and to make it unobtrusive. Your Board is requiring Extenet to appear at public hearings, and provide evidence that the facility shall operate within federally mandated safety limits, there is a justifiable need for this facility within the Village, and the facility complies with applicable law. Anticipate further announcements regarding the date and time of these public hearings, and a special outreach will be made to residents who live closest to the location. ROADS: The Village plans to undertake the road improvement project of Bellows Lane, Stuart Lane and Eakins Road (south) this summer. We are in the preliminary phases of this project. Survey work is currently being planned, weather permitting, to prepare the roadway and driveway specs for the project. The Board will keep residents updated on our progress. In addition, the Village plans on repaving Burnham and parts of Kensett following the summer project. VILLAGE ELECTION: The Village election will be held on Tuesday, March 19th. The polls will be open from 12pm to 9pm at Village Hall. There are three positions up for election and the following have submitted petitions to be on the ballot. Current Trustee, Lawrence Ceriello will be running for Mayor, current Trustee Antonio D’Angelo will be running for one of two Trustee positions, and current BAC member Joseph Williams will be running for the second trustee position. All three candidates are running unopposed. More information is available at Village Hall. PSEG MAINTENANCE: PSEG has notified the Village that they will be replacing existing poles and related equipment starting in April. This is in an effort to strengthen the most vulnerable sections of the energy grid against extreme weather. PSEG will be sending Village residents a letter with more information. In addition, you can find the PSEG notice letter on the Village website. If you should have any questions about this please contact PSEG Long Island Customer Service at 1-800-490-0025. CAR AND HOME SAFETY: As a reminder, do not forget to lock up your homes and cars. There have been a number of car thefts in the Manhasset area. Do not leave any valuable items in your car. If you have a burglar alarm, use it whenever you go out and always at night. SNOW REMOVAL: The Winter season has been mild this year, but winter is not over. As a reminder, residents must clear snow and ice from the sidewalk adjacent to their home. It is critical that all the walks are cleared. One uncleared section effectively eliminates access to the sidewalk for the entire community. The safety of our residents depends on everyone doing their part. The Fire Department has also asked us to remind you to keep fire hydrants outside your homes clear. Lastly, it is also important that you clear a path to your garbage cans so that the carter can safely perform its duties. Meadow Carting will not pick up garbage, if a path has not been cleared. EMAIL: The Village experienced some email distribution problems with its server recently. The problem has been corrected, but please check your spam or junk folder for any missed emails. If you know of anyone that is not receiving the Village emails and would like to, please direct them to signup on the Village website or contact Village Hall for assistance. NEXT MEETING: Our next meeting will be March 13 at 7:30pm. Presiding Officer Nicolello invites all to attend a Hearing on the County Executive’s Reassessment Plan and its impact on Nassau homeowners. The purpose of this hearing is to ensure transparency from the Administration and question the County Assessor to clarify the impact of Curran’s Reassessment Plan on Nassau homeowners. All Nassau residents are invited and encouraged to speak at the hearing. Space is limited! If at all possible, please let us know if you plan to attend so that we can make sure that our facility will be sufficient for the hearing. Please contact repcaucus@nassaucountyny.gov or 516-571-4218 if you plan to attend. Thank you. Please feel free to contact me with any thoughts and ideas you have with respect to the county or on any particular issue where I may be of assistance. You may contact me at 516-571-6209, by email or by message on Facebook. Once again, in our on-going effort to restore and renew the beautiful tree canopy over our Village streets, the Village will be planting trees throughout the Village. We have selected beautiful specimen trees grown by Marando Nurseries of Manorville, Long Island, one of the region’s premier growers. We have selected for planting “White Oaks”, a beautiful tree, iconic in our Village, and Zelkova “Green Vase”, a gorgeous tree widely considered as a substitute for the American Elm. We expect planting to begin in the next couple of weeks. We still have a few trees available for planting if you are interested in having one planted in front of your house. Just let Maureen Mclean in Village Hall know as soon as possible. The Board of Trustees hope all the Village residents are enjoying the end of summer and the start of a new school year. The Board did not meet in August so we wanted to update you on issues discussed at our September meeting and other issues that are currently affecting the Village. REMEMBRANCE: Please take the time to remember all the families that were affected by September 11, 2001, especially our Village residents. They include Thomas Burke, Paul R. Casio, James Connor, Joseph D. Dickey Jr., John F. Iskyan, Timothy C. Kelly, and Frank Salvaterra. TRAFFIC & SAFETY: School is open. Back-to-school time means more pedestrians and bicyclists around our schools and in our Village. Please drive safe and give yourself some extra time. There are first time students walking our streets with parents who will be very excited about the new year. Let's make sure we have a safe start to the school year. Slow down, come to a complete stop at the stop signs and find a safe spot to drop off and pick up your student. Please observe all parking signs in the Village, especially around Munsey Park School. During Munsey Park school open house evenings in September, parking is restricted to one side of the street, please observe all parking restrictions. Village streets are too narrow for double side parking and restricts access for emergency vehicles. ROADS: The Hawthorne/North Eakins road re-pavement project was completed over the summer and we thank all of the residents for their cooperation and patience during the construction. As we continue to address the infrastructure needs of the Village, we are focusing on the worst rated roads according to the VMP Road Ratings Map, which can be found on the Village’s website. The Village currently has a bid out for the repaving of Hunt Lane (Abbey Road East to Sully Drive), Earle Place and Morse Lane and hopes to complete this project in the Fall. We will update residents on this project at the October meeting after we receive all of the bids. SENATOR ELAINE PHILLIPS ROAD GRANT: The Village would like to thank Senator Elaine Phillips, who granted the Village $150,000 for our roads. We will put this generous grant towards our next infrastructure project. The Village will continue to apply for road grants at the town, county and state level and we are hopeful to get even more financial assistance to improve our roads. EXTENET: We are pleased to report that Extenet, the company that had applied for a special use permit to install a cell node on Manhasset Woods Road, north of Park Avenue and then sued the Village of Munsey Park for not approving the application, has withdrawn the application and voluntarily discontinued the lawsuit against the Village. We are delighted with these developments. Notwithstanding the foregoing, the interest of cell providers in adding cell facilities may continue and Munsey Park, along with surrounding Villages, may receive further requests to consider these telecommunication facilities. The Board stands ready to enforce the provisions of the Village Code to protect the interests of our residents. At this time, however, the matter is closed. The Board will continue to insist on strict compliance of the Code in connection with all future applications for telecommunications infrastructure in the Village. The Village will also continue to monitor associated events, in Munsey Park and in nearby Villages, and will keep residents informed of further developments, if any. ON-GOING TREE REPLACEMENT: The Village is continuing with its efforts to restore the right-of-way trees throughout the Village. Over the past year, we have planted approximately 40 trees – London Plane, White Oaks and Zelkova trees on Manhasset Woods Road, Park Avenue and various other streets upon request of residents. This Fall we expect to plant another 36 trees of various types throughout the Village. If you are interested in placing your name on a list to obtain a tree along the street in front of your home, let Village Hall (Deputy Clerk Maureen Mclean) know. We expect to be placing our order with the tree farm in the next few weeks and planting will occur after the first frost in November/December. VILLAGE ENTRANCES: You have probably noticed some landscaping improvements at the entrances to the Village at the Park Avenue Hill and at Manhasset Woods Road. Things have moved slowly due to the availability of suitable plants, the sudden onset of hot, dry weather earlier this year and the lack of irrigation in those spots. However, we are now moving to complete the project. We expect to install landscape lighting and irrigation in those areas this month and finish planting thereafter. We think that you will like the results. MLWD WORK: The water district is conducting an upgrade on a Park Avenue waterline from the water tower. They are currently waiting for the approval from the health department to complete the waterline tie-ins, which should occur in the next week or so. All affected residents have been notified by the MLWD. Once these tie-ins are complete, MLWD restoration of Park Avenue will begin. NO SOLICITATION LIST: Various organizations have been soliciting Village residents asking for their support or contribution to a certain cause. If any resident would like to be placed on a ‘Do Not Solicit List’ please contact Village Hall. NEW AMERICAN ARTISTS: As you know, the streets in Munsey Park are named after famous American artists – Winslow Homer, Thomas Eakins, Gilbert Stuart, James Abbott McNeil Whistler to name a few. If you’ve visited Village Hall, you noticed reproductions of some of their famous paintings on display. This Fall, we are inviting residents of Munsey Park to submit their own works of art for a limited time display in Village Hall under a program we call “New American Artists”. Village Hall will have more information available on this event shortly. REDWOODS IN MUNSEY? : Yes! A little backstory since the story behind Dawn Redwoods is fascinating! The Dawn Redwood (Metasequoia glyptostroboides) is believed to have once been one of the most widespread tree species in the Northern Hemisphere. Fossil remains of this redwood were found in North America, Asia and Greenland. Scientists had concluded that it must have been extinct for millions of years. However, in 1944, a Chinese forester found an enormous dawn redwood in a remote province of China and in 1948, a small group collected the seeds and distributed the same to various universities and arboreta worldwide for growth trials. The tree has made a remarkable comeback and may now be found in NYC’s Central Park and in London among other places. Unlike most other conifers, the tree is deciduous, seasonally dropping its delicate needles in the late fall. 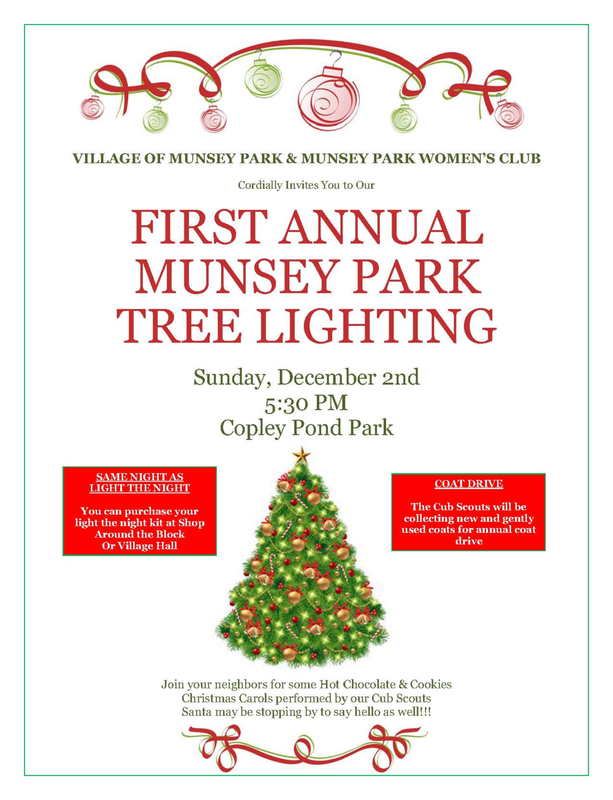 Now, through the generosity of Joseph Marando, owner of Marando Nurseries of Manorville, the tree farm where we have sourced our right-of way trees, 2 Dawn Redwoods will be donated to Munsey Park and planted, one each in Waldman Memorial Park and Copley Pond Park. Once we have a date for planting, we will let you know. With the possibility of significant weather events approaching our area this season, here are some useful phone numbers to keep on hand. • NYS Department of Transportation’s 511 service: www.511ny.org or call 511. NEXT MEETING: Our next meeting will be October 10, at 7:30pm.